A vertical wine cabinet is an excellent choice for wine storage. The traditional style wine storage cabinet usually consists of open storage for glasses on top, a serving area, several bottle storage cubbies on the bottom and a storage drawer for bottle openers and accessories. The functional design of a classic cabinet like this makes it a great addition for in-home entertaining in your dining room or living room. A piece like this is also wonderful for small spaces as it provides a lot of storage in a small footprint. The cabinet on the right has a traditional vertical design with an upper compartment for glasses, a drawer and wine bottle storage below. It features sleek styling and a dark colored finish. The cabinet on the right is available at a leading retailer for $1087.20. The cabinet on the left also has a distinctive vertical design and a dark finish. It also features a storage area on top for glasses, a serving area, a useful drawer and bottle storage on the bottom. 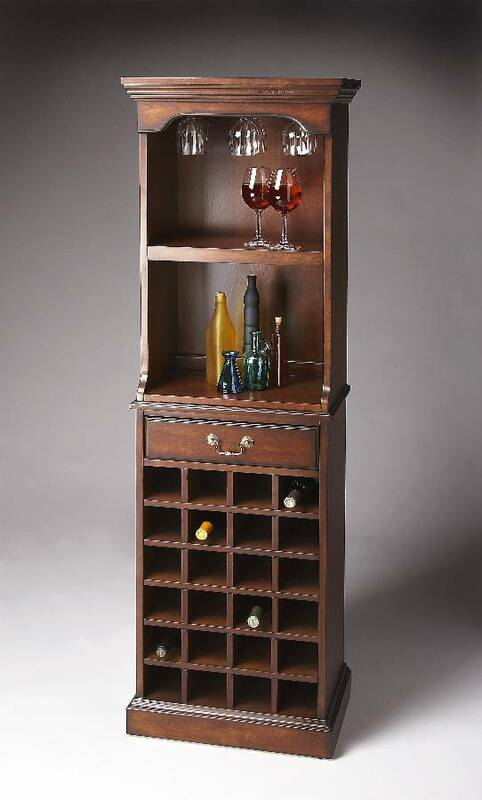 The striking vertical wine cabinet on the left is available at http://www.cheapchicdecor.com/ for only $559.00. It is not necessary to spend a lot to get the look you want. Be a savvy consumer. With careful shopping you can find a similar look for a smaller price tag. For more looks for less visit http://www.cheapchicdecor.com/.